Logic confusion is one word we like to toss around at Smart Power in regards to power issues. You might’ve heard the term used in conversation, so it’s time we explained what logic confusion is and why you should be concerned. In past issues you’ve read about how our products work to combat power attacks, such as spikes, swells, surges and outages. Everyone knows what a power outage is, and we’re willing to bet you dread them just as much as we do. 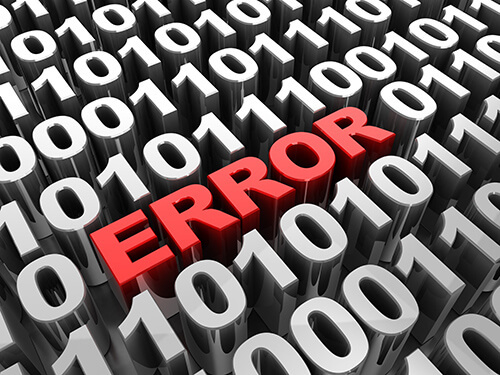 But logic confusion is a lesser-known evil that manifests itself in the form of system crashes, paper jams and error messages that end users interpret as a problem with the equipment — when really it’s an issue with power quality. So what is logic confusion and how does it mess with our inner workings? Inside your electronic equipment are microprocessors. A microprocessor, also called a CPU, can be programmed to do various functions, but it basically takes the data you give it, manipulates it according to its programmed directions and outputs the result. The language the microprocessor “speaks” is called Binary code. Binary is a language entirely comprised of 0s and 1s. Everything the microprocessor does is based on 0s and 1s. The command “00110101” could tell the microprocessor to add two things together. When it comes time to use your copier, POS system or computer, the microprocessor acts like a switch, turning on and off millions of times per second. When it turns on, the microprocessor reads a “1” while it reads a “0” in the off state. Here’s where the trouble always starts. When the microprocessor is confused it registers a 1 when it should read a 0 or a 0 where it should see a 1. A noisy line means a noisy data string of 0s and 1s with a lot of “confusion” between the two, hence the term logic confusion. If your line is noisy and there’s a lot of logic confusion, you’re in for a rough ride. Because the mixing up those two little numbers means issues with your equipment that will probably result in “no problem found” service calls, lost time and wasted money. Copiers can be plagued with issues from logic confusion, such as paper jams, power “blinking” and error messages. 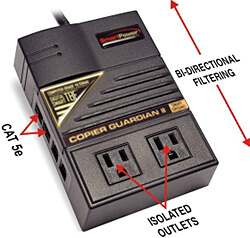 Smart Power Systems’ Copier Guardian II with Smart Ground is a complete filter solution that eliminates the line noise that causes logic confusion as well as the more well-known power issues like swells, surges and spikes. In addition, Copier Guardian II is equipped with Smart Power’s new patent-pending Ground Loop protection, which will safeguard your equipment from data errors, component failures and safety hazards. It also filters voltage all the way down to 0.5 Volts, making it perfectly safe for microprocessors. With all of its exceptional functionality, the Copier Guardian II is the only product of its kind; Competitor products don’t even come close to resolving power problems at the level of Smart Power’s patented protection! Logic confusion is another threat to your office or business equipment that can be avoided. For more information about logic confusion and how you can protect your electronics from becoming victims, please visit www.smartpowersystems.com or call us at (800)882-8285. PreviousPrevious post:Lightning strikes coming soon to a location near youNextNext post:Q&A – Why should I purchase an Electronic Power Conditioner from Smart Power?